OP: How long was the "normal" line compared to the "Priority" line? priority none. Normal about 4 double banks. A lot. Moral of the story: It isn't a good idea to start a thread here ostensibly asking for information or opinions if all you really want is unconditional approval and support. There is always a risk of getting responses you find uncomfortable, surprising or unsupportive. That is not why I asked the question and you know it. I wanted an explanation. I got it but what I didn't expect or want was the assumptions, criticism and insults in the process. The lesson is don't expect people on the forum to be at all friendly or understanding. whilst I am 100% certain that you had no intention to had that lady fired, this is undoubtedly the way in which she will have understood your request, correctly in the Japanese context. This situation must play out on each and every shift then. There will be loads of people using HND airport who have absolutely no clue about how things work in Japan. And really, the agent is there to deal with passengers unhappy about a ridiculous and unexpected rule, so of course some will ask questions (let alone argue or kick off altogether). It does not specify that the frequent flyer status must be with the carrier with which the passenger is flying. It just shows, in the case of JL, First logo, followed by 3 JL status cards/logos. It doesn't really mean much in itself, with no background information. What they should do is to have a card explaining the situation in English and Japanese and put it up on that board showing the eligibility criteria. In fact I'll dump that suggestion on them when I'm there next. I have seen lots of completely confused and surprised people (myself included, once when flying on ANA in J on an F-less flight, with non-ANA Star Gold) caught by this rule. The signs do specifically say that at the top, that the status membership must match the airline flown. I am fairly certain that it has not always said that, but I read the sign more closely again about 6 months ago. Since this is a topic to frequently pop up in many fora on flyertalk. This worked when they wouldn't let me in the First class lounge last week. Maybe it would work at the fast track line. I’m sure the personnel are used to people being taken aback by the rule and thinking they are entitled to fast track and unhappy to get rejected. However, my point about fearing way more drastic consequences than obviously intended was specifically about the supervisor/line manager being involved, and I certainly wouldn’t expect that to happen often. There have been many times where the employees did not know the rules. Why should I take the word of someone if all they do is say "British Airways" to me instead of explaining why I am wrong when I am convinced I am right. I accept I was wrong but stand by me insisting when there was no explanation as to why I might be wrong when I believed I was right. Had it been explained I would have accepted it immediately and that is why I will not accept the DYKWIA label. I didn't have any jumped up sense of importance which is the defining mark of a DYKWIA..
Eh, maybe because you were in japan and its very possible the staff spoke Japanese and was trying hard to explain to an argumentative foreigner as best she could, trying not to inconvenience many others behind ! mikem004 and Talking Penguin like this. Easiest way is to make sure you have a stamp on your boarding card from check-in. 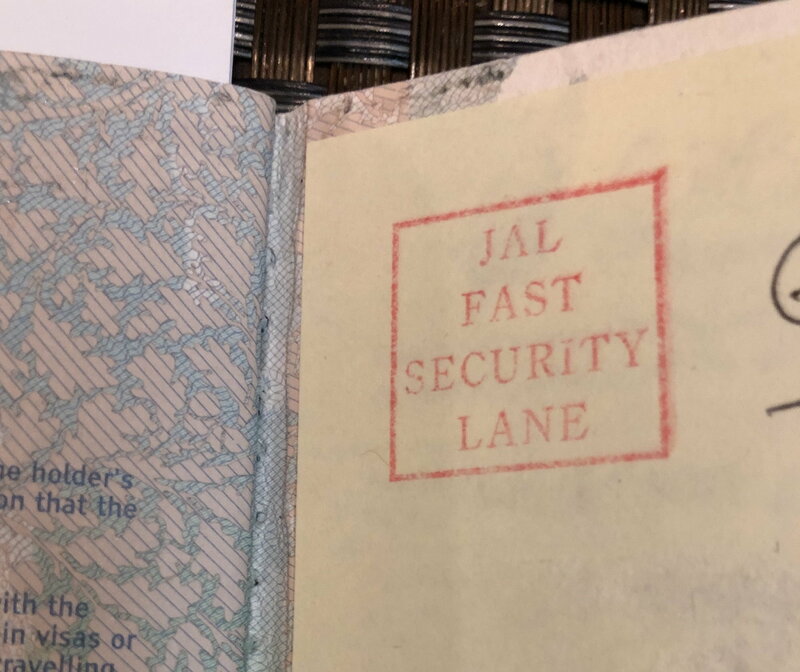 I have never had an issue at NRT but the red 'JAL Fast Security Lane' stamp avoids any doubt. if you use the oneworld priority lane u're fine. Do know what... I am gobsmacked at the lack of support I have had in this thread. Given the BA marketing for BAEC and even on this forum there is no suggestion that I can find that there is anything other than Fast-track security offered as per normal or not offered. I know that at some airports there is no fast track at all and if it is not available then I cannot get it. But I have seen nowhere that there can be variations of the normal like at HND. There is no asterisk or note to suggest that it is any different to normal if it is offered. I have searched and cannot find where it says that there are variatios such as at HND so is it not reasonable to assume that if it is offered then it is as per normal? I have taken the comments here and tried to see it from your perspective and I keep coming back to the fact that nothing anywhere suggests that it should be any different. I believe I am being unfairly and incorrectly admonished and criticised when I feel that my expectations were reasonable given the information available. Even their board did not explain the departure from normal One World procedures. As for me breaching Japanese culture... this is a large international airport. You can't expect me to read up on all the local customs each time I transit an airport. I was there for one night and didn't leave the airport. I think you are being wholly unreasonable to expect me to do that. If I somehow insulted the agent then I regret that but they should accept that people won't know any better and be able to handle it. She should have been able to handle it better than just saying "British Airways" or got someone else who could. The fact that the One World Alliance has these anomalies is disconcerting... how many more undocumented "gotchas" are there I wonder. It seems you get Priority check-in... except when you don't, you get priority security... except when you don't, you get priority boarding... except where you don't and you get lounge access... except where you don't. All this would be fine if the exceptions were documented and actually applied. I thank you all for your opinions and you are entitled to them but I don't agree with many of them and yes, I do feel upset that I have been brandished as some kind of villain when all I was doing was expecting to get my normal Silver benefits as per all the documentation I have seen. At least my question has been properly answered and I have been educated in the One World ways, Japanese culture and how to become a DYKWIA by simply asking for what I believed I should get. Perhaps I should stop asking these kinds of questions altogether if this is the response. I do not deserve to get the DYKWIA label and I totally reject it as it is not true... never has been... never will be. Enough said on this thread by me I think. This isn't how things work in Japan!! Don't taint beloved* NRT with the same brush please! *I am being facetious, but NRT has its good points, no matter how much it gets maligned for being 'too far' from Tokyo city centre. wmaciej and snaxmuppet like this. As for me breaching Japanese culture... this is a large international airport. You can't expect me to read up on all the local customs each time I transit an airport. I was there for one night and didn't leave the airport. I think you are being wholly unreasonable to expect me to do that. What are you looking from this thread? Are you just looking for validation of your actions or are you looking for guidance on future action? I thought that it was the latter but this post suggests that it is the former. Expecting a modicum of cultural sensitivity is not unreasonable. Nobody expects anyone to read a 10 volume précis of cultural étiquette for all countries that one travels through even for a few hours but I would have thought are a certain number of themes and potential flashpoints that it would not be unreasonable for expect the average international traveler to have some basic awareness of. It is not exactly unknown that confrontation and loss of face are one of those potential flashpoints in many Asian cultures. When one has insufficient familiarity with the local culture, it is therefore probable to err on the side of caution and be aware that confrontation or directly calling into question the judgment of someone (for instance by appealing to their superior) is something that you would probably want to avoid unless it was on a crucially important matter that could not be avoided. Most of us make cultural mistakes at some point when traveling. I certainly have. The question is not whether I was right or wrong at the time, whether there were reasons for me to act the way I did or not but rather what to take from it for the future. developing caution around certain themes. And if this thread helps you develop an awareness of potential cultural pitfalls when traveling internationally, I would have thought that it would be rather more important and positive for you than what a bunch of strangers on the internet may or may not think of actions that you might have taken in the past and that you cannot change anyway. jerry a. laska, orbitmic, Schiehallion and 2 others like this. justin_krusty and geerat like this. I don't want anything from this thread now... I got what I posted for. I posted because I felt that I was incorrectly refused priority security at HND and thought that this was wrong and I wanted to ask if this was or was not correct and that is pretty much what I asked for in my OP. I got the answer... I was wrong. Thank you for putting me straight. However, because certain people decided to make assumptions and also to start insulting me by calling me a DYKWIA I have started to push back. All I wanted was the answer to my question but I seem to have been treated like some kind of naughty boy and told off for not considering Japanese culture and for acting like a DYKWIA and so it has turned into some kind of argument over nothing to do with the OP. I do and did not want anyone to tell me I was right. I am happy that on this occasion I screwed up a bit and I admit I could have handled it better myself and will do in future. However, I don't think it fair that people start accusing me of being a DYKWIA without actually being there. At no time were voices raised nor did I show any loud or aggressive behaviour. I simply said I thought she was wrong as I thought I had priority security as I was BA silver/OW Sapphire. That is not DYKWIA behaviour and yes, I got cross and felt insulted that anyone would accuse me of that without knowing me and without being there. Also, it is worth pointing out that was the normal line not so long I wouldn't even have challenged it. In fact, I checked in at the Economy check in desk even though there was a Business class check in round the corner because there was no one waiting. I am not a status snob and I resent people suggesting I am. I have taken on all the comments made though. Thank you. I shall be more culturally sensible in future if I can and next time I am refused something like this I shall return to the check in desk (if poss) where there are always English speaking people to help explain. So I got what I wanted from the post and I hope others reading will see past the insults thrown at me and get this useful info from it too. Can we put this to bed now please?